How to package your gourmet food and candy items for retail, markets, and events. Spring is a notorious time of year for candy and sweet treats with the Easter holiday, shopping, and events keeping people active and outdoors. It’s the perfect time of year for hosting parties and events, shopping at farmer’s markets, and exploring new local shops. When packaging candy or gourmet food items for retail or events, presentation is extremely important. There are several technical concerns with food packaging like FDA approval for direct food contact and the risk of products melting or leaking in your packaging. Some packaging materials that are available in-stock can help mitigate these issues, and some packaging is purely for fun and fashion! Choosing what’s right for your food items is easy, and this blog post can help you determine what kind of packaging you need. These clear plastic candy bags are without a doubt one of our favorite candy packaging options! These ultra-clear heavyweight plastic bags have reinforced bottoms so they can stand up on their own for an effortless and beautiful display. The clear plastic is FDA approved for direct food contact so you don’t have to worry about any extra interior packaging for your candy or food items. 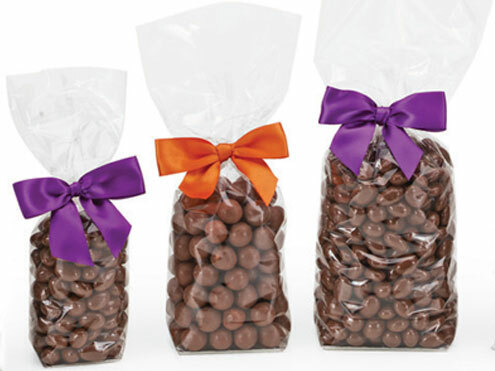 Finish decorating these candy bags with a ribbon of your choice, and add custom printed labels for nutrition or product information. These polypropylene bags are moisture and grease resistant so you never have to worry about grease or melted candy leaking through. These bags are a great choice for retailers of candy, snack foods, and other smaller gourmet food items that require food-safe clear packaging! 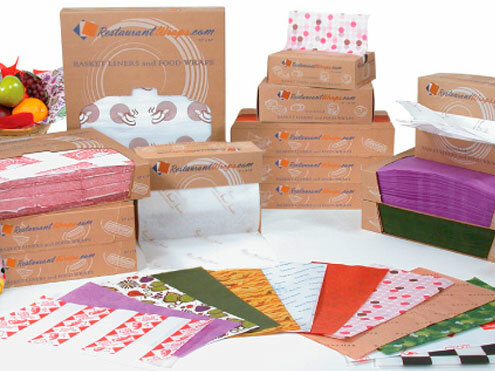 Food service tissue sheets are much like regular tissue paper, but they are designed for direct food contact for a wide variety of food items. There are different weights of food service tissue available, some lighter options are ideal for bakeries, while some heavy weight options are better for greasy and hot food items. Food tissue sheets can be useful for bakeries and cafes to grab items from the display to give to customers or place in a to-go bag. Our high performance dry waxed wraps are great for heavier baked goods, gourmet desserts, food trucks, and much more. Use food tissue sheets to line takeout boxes, food trays, and baskets for a protective barrier against food leakage and moisture. These options are great for a variety of snack foods and desserts. Food tissue sheets help keep your food packaging sanitary and convenient, and with several colors and patterns to choose from they can be stylish too! Tin-tie paper bags are FDA approved for direct food contact and are moisture and grease resistant. Clear polypropylene laminated inner liners make these bags ideal for even greasy or buttery food items. These simple bags are great for many types of food items, and are extremely convenient and easy to use. Simply use the attached fold-able top to close the bag for retail or to-go packaging. Add a custom label to help stylize the bag and identify what’s inside. These bags are an inexpensive way to package food items for farmer’s markets, retail shops, and special events. 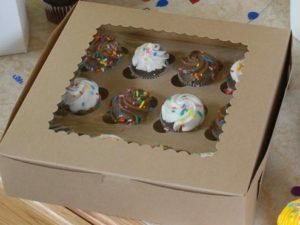 Bakery boxes are a great packaging option for all types of baked goods including cakes, pies, cupcakes, cookies, and other various pastries like donuts and danishes. For cupcakes, you can purchase special cupcake inserts to hold cupcakes in place and ensure they don’t move around or get smashed. There are several lining options for bakery boxes depending on what you are going to put inside. Cake pads are a great choice for cakes and pies, as they add stability to the boxes and provide a moisture barrier between the box and food items. Food safe tissue is a great choice for cookies, donuts, and pastries as it can provide an effective sanitary barrier and some grease resistance. Bakery boxes are great because they are FDA approved for direct food contact, can be used in the fridge or freezer, and are made with 100% recycled materials. Bakery boxes are extremely versatile, easy to use, and are eco-friendly, making them a perfect packaging choice this season. 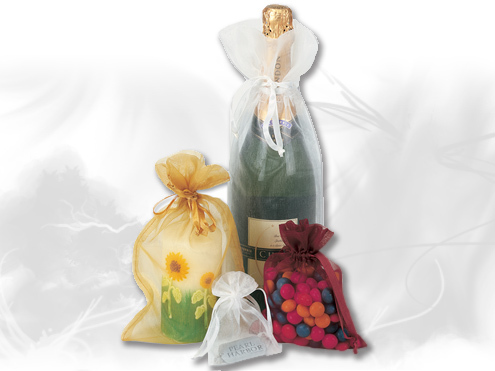 Organza pouches are a stylish and colorful packaging option for gourmet food items and candy. With this option, you will need to have your food items packaged in food-safe packaging first, then place them in the organza pouches with ribbon drawstring closure. The sheer organza provides a beautiful presentation, but does not offer the right protections for direct food contact. These reusable organza pouches are a much more attractive packaging option than just clear plastic, and there are a wide variety of colors to choose from. 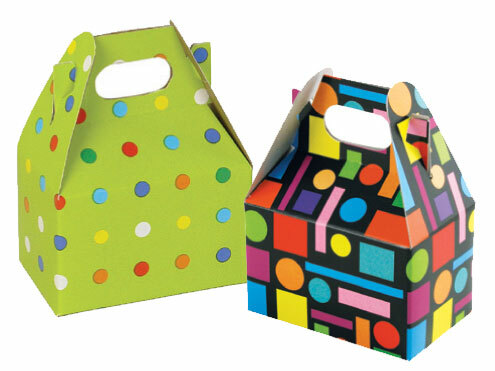 Gable boxes are a fun and eco-friendly way to package food items for retail, restaurants, and events. There are many solid colors and patterns available to fit a variety of themes and occasions. These boxes are convenient because they are easy to lock closed with tuck-tabs and have an included die-cut carrying handle. These boxes are great for retail, farmer’s markets, and other occasions where customers need to carry their items out. It is recommended to line your gable boxes with food-safe tissue paper or wrap your food items to keep the gable boxes safe from grease or moisture. It’s easy to get creative with your gourmet food and candy packaging, even with only in-stock packaging options. At Splash Packaging, you’ll find all of the packaging items above as well as additional creative packaging options like pillow boxes and cellowrap. Splash Packaging offers high-quality packaging for gourmet food items at always-low wholesale prices.